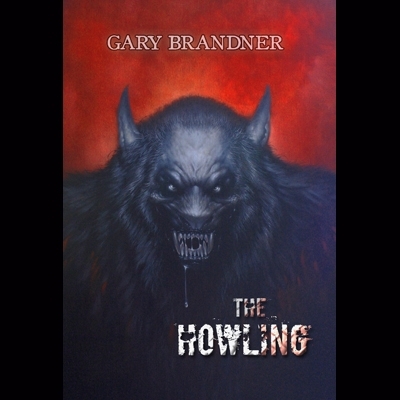 To some of you, it may come as a shock, but, believe it or not ‘The Howling’ is based on a novel. I say ‘shock’ because it’s always hard to believe than any good movie can be based off a book, but it does happen, once in a great while. I mean, hey, look at Harry Potter, and the Chronicles of Narnia, –those were once books, and the film success, while relative, is mostly monetarily measured. 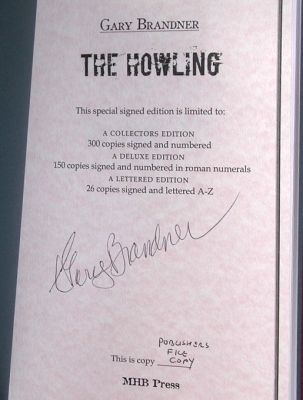 The Howling is a classic werewolf film and for many serious horror literary collectors, this is a once in a lifetime chance to get The Howling in hardback. And these hardbacks do nothing, if not give author Gary Bradner due credit. Not only has the novel been re-released in hardback, but three different collector’s editions have been composed, and are now being circulated in limited number, at prices you won’t see them at for long. “The Collector’s Edition (£40) is limited to 300 numbered copies. Bound in Colorado cloth with headbands, coloured endpapers & bound in ribbon bookmark. The Deluxe Edition (£110) is limited to 150 numbered copies. Quarter bound in grey goatskin leather with cloth-covered boards, headbands, marbled endpapers, bound in ribbon bookmark and raised bands on spine. Contains interior artwork not found in the Collector’s edition. The Lettered Edition (£395) is limited to 26 copies, lettered A through Z. Hand sewn, fully bound in goatskin leather with foil blocking to front and spine, raised bands on the spine, gilt edges, handmade marbled endpapers, headbands and bound in ribbon bookmark. Housed in a hand-made solander traycase. Also contains interior artwork not found in the Collector’s edition. May cause nearby werewolf fans to weep. While I can see some difficulty in getting ahold of the lettered edition before it’s sold out, there’s definitely no reason for anyone to pass up the chance to get a signed hardback collector’s edition for £40. Think of the cherished memories you’ll have in as a grandparent, reading it to your grandchildren, or to your own kids before bed! Or if you’re not a total maniac, you could just keep it preserved in plastic wrap on your bookshelf, between those carved human skulls you bought from the guy with the club foot and lazy eye last month! …Well, that’s what I would do anyway.